Thanks to everyone who helped make the Big Lunch this year (July 18th) such a fantastic event. 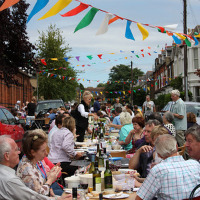 More than forty members of All Souls and the North St Margarets Residents Association (NSMRA) helped set up and organise music, children’s fun and places to eat for an estimated 300+ local people. How would you describe All Souls? By Richard|2009-11-01T23:02:05+00:00November 1st, 2009|News|Comments Off on How would you describe All Souls?